Normally, we start with a welcoming circle, then some meditation, some gentle movement or dance, time for tea & snacks /chatting/ card reading/ resting, a closing circle. Do you ask participants to bring anything, wear red or make a donation? : I ask people to make a donation of €3-5 if they can, or bring some snacks/drinks to share, but none of this is compulsory. 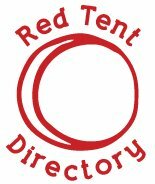 What language is spoken in your Red Tent? : English & occasionally Irish.